Waoowww ... Surprise sekali buat Gw salah satu Penikmat Enjoy genre Folk Metal !! kenapa Surprise, biasanya memang Genre Folk metal yang Gw dengar memang terkesan menampilkan musik metal dengan harmonisasi Tradisional yang unik dan berbeda tiap band menurut filosofi yang dibawa, mungkin Korpiklaani terasa liar, Ensiferum kental Melodiusnya begitu pula dengan Turisas, Finntroll atau yang lainnya tetap menampilkan semangat Tradisional bermusik dengan konsep yang terasa metal banget, jelas Kaget juga mendengar Konsep yang lebih Liar, Buas dan Brutal lagi Gaya Tradisional Folk metal dari band asal Oslo, Norwegia ini, TROLLFEST !! dengan lebih mengangkat lebih kental Legenda Mahkluk Buas bernama " Troll " yang mereka sebut sebagai " trollspråk " yang merupakan penggabungan bahasa antara Norwegia dan Jerman, dan dengan Penampilan ga seperti Tradisi Band2 Folk Metal yang Masih membawa Imej dan karakternya, Trollfest masih cenderung memiliki Fashion seadanya dan terkesan biasa. Ok Mungkin yang merasa belum tahu banyak tentang Legenda Mahkluk Troll, bolehlah Gw tambahkan disini, Troll adalah makhluk buas sejenis raksasa dalam cerita-cerita rakyat Skandinavia. Mereka hidup di gua-gua yang dalam dan gelap, atau di dalam tanah. Mereka berukuran lebih besar daripada manusia dan memiliki tenaga yang besar. Karakter Troll mirip dengan Ogre (baca: O-gêr) dalam cerita rakyat Inggris. Dalam kisah-kisah fiksi fantasi atau games, karakter Troll sering dipinjam sebagai karakter pendukung. Dalam kisah The Lord of The Rings, Troll digunakan sebagai tenaga pengangkut beban yang berat atau sebagai pasukan penghancur dari kerajaan kegelapan Mordor. Bersama para Orc, Troll menyerbu kerajaan Gondor. Dalam kisah Harry Potter, troll merupakan makhluk raksasa yang hidup di pegunungan dan sangat buas. dan dialbum baru ini masih menggunakan artwork kover Mahkluk Troll yang mereka gambarkan lebih Cuties dan Keren seperti pada beberapa artwork album sebelumnya, rupanya cukup menarik perhatian gw untuk pertama kalinya. And so, given today's pressing need for greater cultural dialogue and diversity, the trolls decided not to stand on the sidelines looking like a bunch of ostriches. No sir! They opened up to the world, grabbed the bull right by the horns instead of waiting for the world to open up to them and pulled out "Brumlebassen". Hooray! dan " Brumlebassen " memulai Track pertama langsung dengan sajian Akustik Gitar Folky banget yang kemudian tiba2 bumi diguncangkan dengan Sajian Hyperblasting Snare drum yang mantap !!! dibarengi dengan Permainan Accordian dan Riffing yang Rumit masih bernuansa Folky, typical Trollfest memang lebih keras dari kebanyakan band Folk Metal, walau sempat beberapa kali dianggap sebagai salah satu Kloning band Folk terkenal seperti Fintroll, Trollfest jelas masih memiliki karakter tersendiri. getting stuck on an Orient Express and slowly making their way from Turkey to the Balkans and finally back to Scandinavia. They meet up a bunch of interesting folk along the way, of course, making cross cultural connections, learning that gypsies are people too, contributing to the better understanding amongst different nations and ultimately to the world peace. Ok, so maybe the album's concept has nothing to do with gypsies or world peace. It is really about some evil duckling on a rampage. yuppp memang Jelas beat Trollfest yang track ini lebih menampilkan nuansa Musik yang Chaotic dan Brutal abiss juga Unik tentunya Partisi musiknya !!! kemudian " Böse Tivoli " masih mengulang gaya part awalnya seperti track sebelumnya, nuansa Drinking enjoy adalah salah satu Filosofi lirik yang mereka angkat dituangkan dalam karakter musiknya, tetap memainkan Komposisi yang cepat, Semakin terdengar Unik saja aransemen musik yang mereka ciptakan mulai dari harmonisasi dan Konsep folk metal-nya, walau begitu permainan accordian dan saxopone yang tetap tradisional gayanya menjadi kekuatan ampuh Trollfest tetap diklaim sebagai band Folk Metal, walaupun beberapa gaya Death Metal dan Black Metal terasa cukup kental. " Illsint " Drummer Trollbank tetap melakukan Gerinda Hyperblast snare yang menawan dipadukan dengan gaya Tradisional Accordian dan Saxopone, Cool Track, I Like it !!!!!!!!!!!!! If a Viking clan had a party with a traveling gypsy caravan while a black metal band was playing in the background, the end result may well be something along the lines of Brumlebassen. benar2 mendengar 13 lagu berdurasi 47:57 dialbum baru Trollfest ini tetap menimbulkan kesan yang berbeda aja dari beberapa band Folk metal yang Gw dengerin selama ini, Trollfest memang Tampil lebih Liar, Buas dan Brutal pembawaannya, dengan talenta diatas rata2, ga heran saja All member Trollfest memang dapat meracik dengan sangat apik Etnis Tradisional dengan gaya Bermusik yang metal itu. That will raise a few eyebrows and cause a few hysterical laughs, I reckon, since the band literally and distinctively start quacking like a pack of possessed ducks on at least a couple of occasions. In that respect TROLLFEST can definitely claim the mantle of true metal pioneers. Goats, wolves, dragons, unicorns and hounds are so five minutes ago. Yes sir! Bring out the infernal duck and let the new era of the web-footed ornithoid demons rise and reign supreme! Waoowww ... I Surprise lifeline one genre Folk Metal Connoisseurs Enjoy! Why Surprise, it usually does Genre Folk metal display I heard was impressed with the harmonization of traditional metal music that is unique and different for each band according to the philosophy that brought, might seem wild Korpiklaani, Ensiferum Melodiusnya viscous as well as Turisas, Finntroll or the other still showing spirit Traditional music with a concept that feels really metal, obviously surprised to hear the concept of a Liar, Beast and more Brutal Style of Traditional Folk metal band from Oslo, Norway, the TROLLFEST!! thicker with more lift Blooded Legend evil creature named "Troll" which they refer to as "trollspråk" which is a merger between Norwegian and German languages, and with no look like Bands Tradition Folk Metal that still brings The image and character, Trollfest still tend to have a potluck Fashion and impress. Ok Maybe that was not yet know much about the Legend Being of Trolls, so me add here, Troll is a kind of giant beasts in Scandinavian folklore. They live in caves in the dark, or in the ground. They are larger than humans and have great power. Troll character similar to Ogre (read: O-GER) in English folklore. In fiction fantasy stories or games, Troll character often borrowed as a supporting character. In the story of The Lord of the Rings, Troll used as a carrier force heavy loads or as destructive forces of the kingdom of darkness Mordor. Along with the orcs, trolls invaded the kingdom of Gondor. In the story of Harry Potter, trolls are giant creatures that live in the mountains and very ferocious. 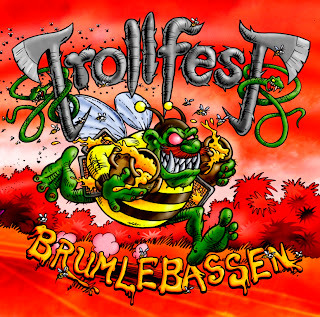 dialbum new and is still using the cover artwork Troll evil creature they describe more Cuties and Cool as in several previous album artwork, apparently enough to attract attention for the first time. And so, given today's pressing need for greater cultural dialogue and diversity, the trolls Decided not to stand on the sidelines looking like a bunch of ostriches. No sir! They opened up to the world, grabbed the bull by the horns right instead of waiting for the world to open up to them and pulled out "Brumlebassen". Hooray! and "Brumlebassen" Track first start directly with a dish of very folky acoustic guitar and then the earth is shaken with Serving tiba2 Hyperblasting a steady snare drum!!! 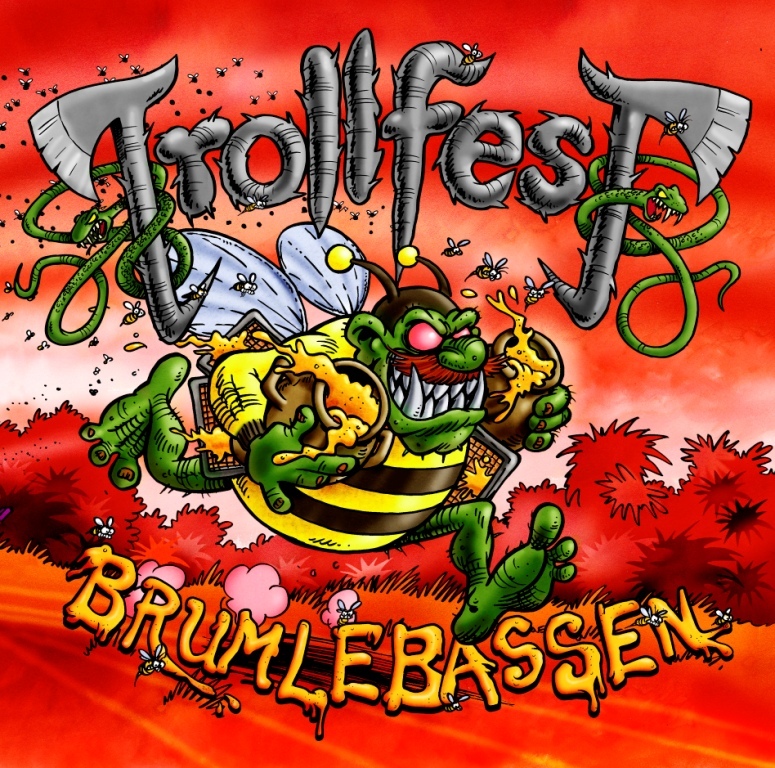 Accordian and games coupled with the complicated riffing still nuanced folky, typical Trollfest was tougher than most bands Folk Metal, although had several times considered one of the famous Folk band such Cloning Fintroll, Trollfest clearly still has its own character. getting stuck on an Orient Express and slowly making their way from Turkey to the Balkans and finally back to Scandinavia. They meet up a bunch of interesting folk along the way, of course, making cross-cultural connections, learning that gypsies are people too, contributing to the better understanding amongst different nations and ultimately to the world peace. Ok, so maybe the album's concept has nothing to do with gypsies or world peace. It is really about some evil Duckling on a rampage. yuppp indeed beat Trollfest Obviously the track is more displays shades Chaotic music and Brutal also unique partition of course music!!! then "Böse Tivoli" was originally as part fashion repeats previous track, feel Drinking enjoy is one of them lift philosophy lyrics poured in musical character, still play fast composition, more unique sound they have created musical arrangements ranging from harmonization and Concepts his folk metal, even so the play remains saxopone accordian and traditional style remains a potent force Trollfest claimed Folk Metal band, although some styles of Death Metal and Black Metal was quite thick. "Illsint" Drummer Trollbank keep doing burrs Hyperblast snare a charming traditional style combined with Accordian and Saxopone, Cool Track, I Like it!!!!!!!!!!!!! If a Viking clan had a party with a traveling gypsy caravan while a black metal band was playing in the background, the end result may well be something along the lines of Brumlebassen. rights hear 13 new songs dialbum duration 47:57 Trollfest remain distinct impression wrote of some Folk metal band Gw listen along, Trollfest Shown is over Wild Beast and Brutal demeanor, with the talent on rata2, ga wonder only All members Trollfest it can be very slick mix with Traditional Ethnic musical style metal with it. That will raise a few eyebrows and cause a few laughs hysterical, I reckon, since the band literally and distinctively start quacking like a pack of Possessed ducks on at least a couple of occasions. In that respect TROLLFEST can definitely claim the mantle of true metal pioneers. Goats, wolves, dragons, unicorns and hounds are so five minutes ago. Yes sir! Bring out the infernal duck and let the new era of the web-footed ornithoid demons rise and reign supreme!